Gordon's Bay - Page 7. The next day we set off heading for Hermanus. We took the Gordon's Bay coastal road which may not be publicised as much as the Chapmans Peak Drive but it certainly held its own when it came to spectacular coastal, ocean and mountain views. The road hugs the mountain rocks as it winds its way round Gordon's Bay with the bright sun making the sea sparkle. Percy doesn't hurry through the scenery allowing me to soak up the view and that he has no doubt seen many hundreds of times before. Here as elsewhere he appreciates that the scenery is something to savour and he travels slowly but safely, pulling over at regular points to allow me to sample the fresh air and magnificent views and is always at hand to point out the wildlife, be it in the air, on the land or in the sea. We arrived in the pretty seaside town of Hermanus late afternoon. 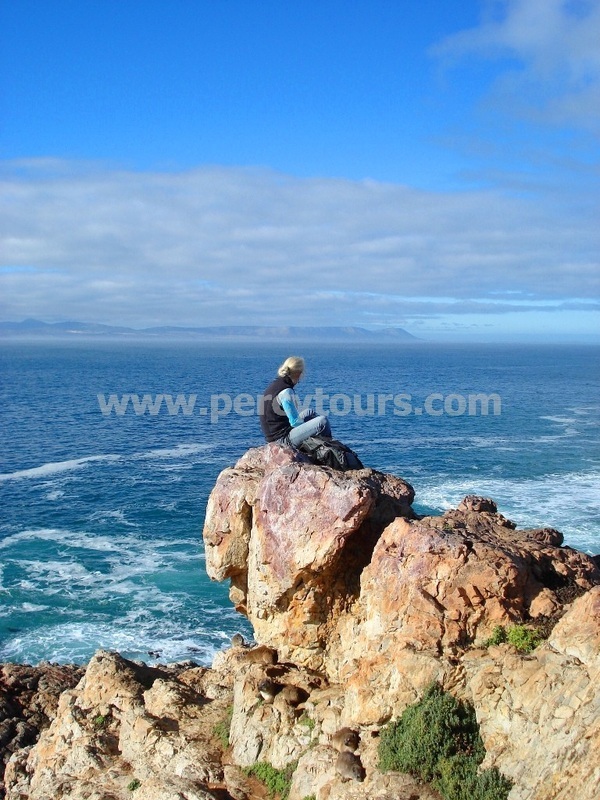 Hermanus is a picturesque, small coastal town that has become renowned as one of the best places in the world to view whales. It is a bolt hole for Capetonians that want to escape Cape Town for the weekend or summer holidays. Percy had booked me in to the Auberge Burgundy hotel, which is situated right in the heart of Hermanus overlooking the Old Harbour and Walker Bay. First impressions were that Hermanus is very compact, it has a good sprinkling of restaurants, an African craft market, boutiques shops, art galleries and miniature shopping malls. I'm fortunately here at the height of the whale watching season so the town is packed as the annual Whale Festival is in town and in full flow. As festivals go it is a village fair affair rather than a Glastonbury. There is live music and stalls selling whale related and non-whale related merchandise, hats, t-shirts, key rings, artwork, pictures, books etc. Thankfully not a single whale burger in sight at the various food stalls, which I was obviously very relieved about. I look out to sea at Walker Bay but I see only sea. But like one of those illustrations that you need to stare at for a while before a hidden picture is revealed, it isn't long before I start to understand what all the fuss is about because there is a whale; and another; and another; and another and "Wow did you see that, it flipped its tail"; "Whoa look at that, it jumped right out of the water"; "Look there are two there, it's a baby. "; "Have you seen that one, it is waving its tail". It's not long before you realise that you are being treated to one of mother nature’s spectacular free live shows. After settling me in and ensuring that I had my bearings, Percy left me to my own devises that evening, allowing me to explore and take in the Hermanus Whale Festival atmosphere.